I am sorry for my gap in posting on Stoned-Campbell but this past week we have had many other matters going on: Weekend guests, Lake Geneva Family Encampment, and band camp that kept me busy with my daughter, Rachael. I hope to make it up to you. Since it is time for back to school (it felt like Fall here in Milwaukee last night!) I thought I would offer a post in that spirit, a reflection on dresses and biblical interpretation. I have learned something about patterns by watching Pamella make dresses for Rachael and Talya. We went to Wal-Mart, looked through seemingly hundreds of catalogs, picked a “pattern,” bought material (all while I waited patiently!). When we got home I soon discovered that several different dresses could be made from the same pattern. You can have long sleeves, short sleeves or no sleeves. You could use several different types of fabric and colors. The hemline and the shape of the neckline could differ radically. I was amazed because I had been programmed to believe that the term pattern meant “identical!” I would have thought it impossible those dresses could come from the very same pattern. There was nothing wrong with the pattern, only my idea and definition of pattern was wrong. Some Christians believe that the “pattern” requires cookie cutter churches (but my experience with dresses show how diverse a pattern can be). You see what is at issue is a definition of “pattern.” If by pattern I mean architectural blueprint, then nothing can possibly vary. But no one, and I mean no one, is consistent with this view (we do not eat the Lord’s Supper in upper rooms and only at night, we don’t use one cup, don’t wash feet, don’t practice holy kisses, don’t enroll widows, etc). But “pattern” also means model, example or guideline all of which carry significantly different connotations than blueprint. I am convinced the scriptural pattern functions far more like Pamella’s dress pattern. In fact I believe the blueprint notion is simply false and contrary to the diversity that is plainly revealed in the New Testament itself. In conclusion not every congregation that is cut from the New Testament pattern will look exactly the same in all its details any more than every dress made from the same pattern will look the same. But they are the result of the same pattern. This entry was posted on Saturday, August 12th, 2006 at 5:39 pm	and is filed under Bible, Exegesis, Hermeneutics, Ministry, Preaching. You can follow any responses to this entry through the RSS 2.0 feed. You can leave a response, or trackback from your own site. Best analogy I have ever heard on the church and its many differences…. Very interestingf approach I guess the old saying is true, “There is a sermon in anything if you will just look for it.” Do you feel it is even possible to estblish a pattern from the New Testament for what Church is supposed to look like? Or is the pattern to cultivate a the ministry of Jesus into a lifestyle? Peace to you in Milwaukee. I agree with your blog … and the dress pattern is a good analogy. However, if you go to Carvin guitar factory and look at their pattern for a given guitar model, that pattern will turn out thousands of guitars that are within 1/100th inch the same. I think that is where the patternists are coming from. But even those thousands of guitars can all be a different color, so why am I even bothering to respond?! Steve’s right, though. If there is a pattern, it is Jesus. Shopping for patterns is what I was taught to do. If the pattern didn’t fit “The Pattern” I was taught that the “dress” wouldn’t be worth anything. Very sad. There are many I love who would think I’ve chosen the wrong pattern since it looks a little different than their own, but I love the dress! I agree the only pattern should be Jesus and none of us knows exactly what, who, how, where, and when He would do anything – even his disciples couldn’t keep up with him on that and they were his closest friends. Great post! In my view a group of believers whould acheive a more desirable result if they followed “scriptural principals” rather than “scriptural patterns”. It is much more difficult for me to impose a principal on you than a pattern. A pattern, the way it has been historically used, is far more rigid than following biblical principals and allowing others to do the same. The Holy Spirit is immenetly more qualified to steer Christians to proper worship and service than the best theologian. I have a post on “unity” that is somewhat related to this subject. What is the pattern that we are trying to follow? but may God open their eyes to see that the function is what is revealed in scripture as the “pattern”. Thank you for thoughts Bobby. Fantastic post, Bobby. As a non CofCer, I wonder how far you are willing to take this, as far as having musical instruments, even just an old piano incorporated in worship? I never understood the theory about that, except maybe your pattern after the NT except you stated quite eloquently how many things you do not have that they did in Jesus’ day. Just one Baptist stirring the pot. Good analogy – to an extent. Certainly the traditions of churches are going to vary, and certainly we can’t be afraid to try new things. However, this in no way means that we veer from the vital parts of the pattern. Instruments in the worship isn’t even IN the pattern we have in the NT. Baptism for the remission of sins is ALWAYS a part of the pattern. We can’t just ignore the pattern, and do as we please, and just call it “thinking outside the box”. Second reply: An interesting aspect of the so called “pattern” for us is that it simply does not exist. Even the most die-hard patternist cannot say, “Here it is …” and then identify the pattern! The best we can get from them is “Read your bible and you’ll find it.” So I read my bible and if I disagree on any part of what they’ve perceived as “the pattern” then I’m wrong and have failed to discern the pattern. I’m held accountable to something that cannot be produced! That’s a strange doctrine. Our task is not to reproduce some pattern. Our task is to allow the Person of Christ to be reproduced in us through the indwelling Spirit of God. If allowed to occupy teh throne of our hearts, God will produce in us what is pleasing to himself. Thanks for commenting and sharing. David I have visited your site and will link you here at Stoned. Steve I agree that Jesus is THE pattern. Yet he fills his body with meaning and identity. Greg I think your analogy of the guitar factory brings in the blueprint connotations of the word “pattern” rather than simply model or guideline. But as you point out even those guitars do have some individuality. Nikki and MommyHam I really appreciate your comments here. Pickled Preacher. It is good to see a new name and I hope you come back. There are many things that are not in the “pattern” if you use a blueprint orientation. Multiple cups are not there, sunday school classes are not there, song books and shaped notes are not there. But one argues from silence when they make the comment you have about IM. The early church did worship in the temple did they not? Luke says that James and many others were “zealous” for the law and that Paul himself joined in a sacrificial ritual . . . beloved it would have been impossible for Paul and those believers to have done that without instrumental accompainment. We need to think about our use of the word “pattern.” Steve is right that “pattern” will draw it meaning ultimately from Christology. Maybe no one will read this since you’ve already done another post(and that could be a good thing). I love your patttern analogy. I remember when you used it in a church bulletin. I clipped and filed this illustration which has stayed with me for years. Since instrumental music has been brought up yet again, I’ll say that even if one applies “patternism” to determine what is scripturally authorized, the only “pattern” in regard to music is singing. Nothing else is said. To me, whether one sings with or without an instrument is as flexible an issue as whether one prefers long sleeves or short. It’s still the same dress pattern! To borrow John Bright’s phrase “the slavish imitation of a pattern” would imply, as you say, that we are all most inconsistent. Consistency would mean holy kiss, house churches, etc. But I tend to agree with Royce that perhaps we should be talking about principle instead of pattern. The problem with restorationism is that the focus is often on externals as the measure of faithfulness, whereas the things that really matter are not so easily judged. Satan has done a good job at sidetracking us with minutia. Tom according to the KJV Noah used “gopher” wood. But there is no such thing as “gopher” wood. In fact the word “gopher” is simply the Hebrew word transliterated into English because the King’s men did not know what it meant. Many a theological mountain has been hung on this word. The LXX translates the term as simply “squared” timbers. That is Noah built a boat just like any other kind of boat using square timber. Today many scholars believe the term is a generic word for cypress. That may or may not be the case. God no longer dwells in the Temple at Jerusalem with “strict” guidelines as to how He was to be approached in worship or how he is to be approached for worship . worship rules when we assemble. as we serve others, dead to our own desires maintaining, in step with the Spirit. We assemble to edify and be edified. That’s the NT pattern as I see it. Everything else we demand in some congregations is fine as long as we do not try to bind them on everyone else before we will fellowship them. As long as we understand there is NOT a wrong way to worship God as long as it’s our body upon the alter to be sacrificed and we obey the Law of Love we are currently under. We have been set free in Christ except the debt of love. At the risk of this comment not being read, I’ll post it anyway. Those men who demand an exact following of the infamous “pattern” are no different than the Judeizers Paul addressed in his letter to the chruches of Galatia. Having been freed from the ordinances against them in Christ, some converted Jews wanted to impose circumcision on others who were both Jews and Gentiles. In our day, our freedom in Christ is frustrated by those who want to impose various “rules” on us especially when in “the building”. The pattern is not nearly as rigid when not in “the building”. Very telling about our understanding of the Bible isn’t it? The yoke of legalism is sinful, it goes against what Christ has provided, and it stiffles one’s ability to flesh out Christ to others. I think there is a semantics issue at hand, because I think Bobby’s understanding of “pattern” is different than yours, and actually says exactly what you are saying with respect to legalism. When we got home I soon discovered that several different dresses could be made from the same pattern. You can have long sleeves, short sleeves or no sleeves. You could use several different types of fabric and colors. The hemline and the shape of the neckline could differ radically. 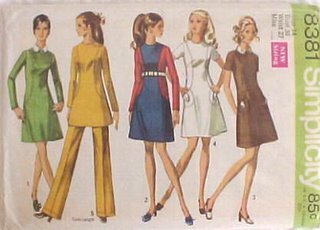 I was amazed because I had been programmed to believe that the term pattern meant “identical!” I would have thought it impossible those dresses could come from the very same pattern. There was nothing wrong with the pattern, only my idea and definition of pattern was wrong. You see what is at issue is a definition of “pattern.” If by pattern I mean architectural blueprint, then nothing can possibly vary. … But “pattern” also means model, example or guideline all of which carry significantly different connotations than blueprint. And I think this one is in keeping with your last point re: Judaizers In fact I believe the blueprint notion is simply false and contrary to the diversity that is plainly revealed in the New Testament itself. Analogy was on a false premise: There were several “patterns” in that envelope. There is only one pattern for the Lord’s church. Patterns, as we talk about them, are generally where we want to see them. In areas where we do not want to see them, they disappear into “expediencies” “non essentials” “cultural applications” or other such. If there is a pattern, we must follow it all the way. If there is not a pattern, we should quit talking about it. Bobby…having “patiently” waited while Ann picked out a “pattern” or two I am impressed by your observations. She also produced a number of variations while remaining true to the basic idea. It did come out as a dress not a suit of armor. The Lord certainly did not desire a church of clones, nor a church of clowns, I might add. Thanks for going on thinking, I have met some folks who believe a new idea might blow the top of their head off. Bob thanks for gracing my blog with your insight and presence. Edna as always I am delighted to have you read and comment. But I will have to gently demur and say the analogy while not exact or perfect still works. One of the easiest variations to pick up on the NT is the difference between Jewish congregations and Gentile congregations. The book of Acts makes is abundantly clear that the Jerusalem disciples continued to worship in the temple and synagogue. As late as Acts 21 we find the author of the book of James (the Lord’s own brother) totally at home in Jewish worship rituals. These Christians in the book of Acts even offer animal sacrifices. How do I know that? Well Luke tells us. Read Acts 21.17-26 carefully. This is 30 years after the death and resurrection of Jesus and this church is “zealous for the law” (21.20). James asks Paul to pay for the Nazarite vow of four other disciples. This is a worship ritual (see Numbers 6). This involved an animal sacrifice. It is interesting that James had no problem with this, Paul had no problem with this, and Luke had no problem with it either. Three inspired people and no problem. This is considerable variation from Galatians is it not? Upon a close reading of the text one can find various points of emphasis or variation between Paul and Peter, or John and Paul. Yet there is ONE church … even in the huge differences between Jewish and Gentile Christianity there was still one church but Jerusalem was much different than Corinth. These differences have always been there but we have at times tried to hide them or obscure them or simply say that the church was wrong. For example J. W. McGarvey reads what Paul does in Acts 21 and decides that Paul at best was wrong or at worst he sinned. That is a strong conclusion when you have three inspired people approving of it. The conformity pattern is something that has been invented and imposed upon the text. We are still guided by the text. There still is a model but the person of Jesus fills the model with meaning beyond technicalities. I hope this helps our discussion. Stoogelover – Stellar point on the “secret handshake” characteristics of The Pattern in the brotherhood. Either you know it because you began hearing it taught while you were in the womb, or you were taught it during Ivan Stewart’s Open Bible Study or some other evangelism pattern, or you learned it at school. Either way, chances are you learned about the pattern before you started reading the Scriptures for yourself. So the pattern defines what you’re reading, instead of what you’re reading defining the pattern. WTH – Noah built the Ark out of the material prescribed by God, in the manner prescribed by God. The Body of Christ (the New Ark, if you will) is built out of the material prescribed by God (people), in the manner prescribed by God (immersion into Christ and imitation of Christ). The four Evangelists lay out the pattern for building the ark STEP-BY-STEP (no hammering together of proof-texts necessary, God has completed that process). Luke continues his work by showing the actual ark-building, according to the manner prescribed. ONCE the New Ark has been assembled, Paul and the other epistle writers give various instructions on how not to sink the Ark, how to keep all the animals inside at peace with one another. And John closes the NT like a sailor up in the crow’s nest, warning about a great storm ahead. Birds are awesome and beautiful. Humans build ornithopters, mechanical devices that look and operate like birds, but consistently fail to allow human flight. Here’s my struggle with the metaphor – While the Wright Brothers did indeed design a machine that flies, the descendants of that machine also emit tremendous amounts of pollution, pour devastating amounts of destruction upon the heads of soldiers and civilians, and played a key role in the bombing of Hiroshima and Nagasaki. Our inability to comprehend the purpose of certain forms does not necessarily suggest that we should jettison them in favor of forms whose future ramifications we cannot accurately predict. I don’t mean that any of the forms currently followed by churches of Christ accurately imitate the 1st century forms. JM Hicks, in Come To The Table, makes a sound case concerning the failure of the current Lord’s Supper ritual to produce spiritual unity. Being a relatively poor singer myself, I’ve often thought that a return to the chanting style of the 1st century would eliminate the divisive elitism that arises between the “singers” and the “shouters” in many congregations. I think your analogy has much merit. As we apply the NT pattern to different situations in life, we will use the various alternatives that are available in it. 1) Don’t we use one cup? I don’t mean one container. I mean “The cup of blessing which we bless, is it not the communion of the blood of Christ?” Doesn’t this verse (1 Cor. 10:16) state that we have one cup? 2) I have frequently said, “I’m off to wash the saints’ feet” as I leave to help a beleagered church member with a physical necessity. Isn’t that why the widows washed saints’ feet, because it was physically necessary? 3) I have received many a holy kiss. They come from people who truly understand the idea of fellowship and unity. Literally I have received these from women. Figuratively, I have received holy kisses from men in the exuberant welcome they give to all fellow Christians, even ones they’ve just met. 4) and “widows indeed” have been enrolled in the church. It is a rare necessity, comparatively speaking. So many of us don’t know about it happening. But it does happen. You’re right, these four things are not practiced ritually in the church. But any church that has lost the spirit of these four items has lost the Spirit of Christ. Patternism reminds me of my mother’s Butterick dress patterns of long ago. Forcing rigid structures called patterns on others is a formula for discord and disharmony as can be witnessed by our own little religious movement. It seems to me our pattern for life is Jesus. Bobby, I loved this one…..at the time i read it my mom and niece were making a dress WITHOUT a pattern! Keep up the good work; I love your stuff. There are some parallels, but only some. There is a certain amount of leeway in the way your “pattern” is used – you can use blue cloth or red, you can choose to use the optional pants – but there is only a limited amount. You can’t use that pattern and make a wedding gown or a sofa slipcover! There is a certain amount of leeway in the New Testament pattern. We can have the Lord’s Supper before the sermon or after, we can have three songs before the opening prayer or only two. We can even use a different songbook. But if we make more changes than the patternmaker has designed into that pattern, then we are going by our own pattern, and not His. How can any self-respecting Christian man let himself get dragged into pattern shopping? If patternism is contrary to scripture then so is pattern shopping with your wife at WalMart. Also, to what are you referring when you say “enroll windows”? Haven’t heard that one… but I can tell I will like it. Wow a comment on this post four years after it was written!! Many things have changed since then. 1) I was being a good husband that is why i was pattern shopping!! 😉 Pamella though decided to live her life without me over a year after this was written. 2) you haven’t heard of the widows? Brother read 1 Timothy 5.9ff. Its amazing the mental gymnastics that have been used to make this NOT a ‘pattern’ requirement.